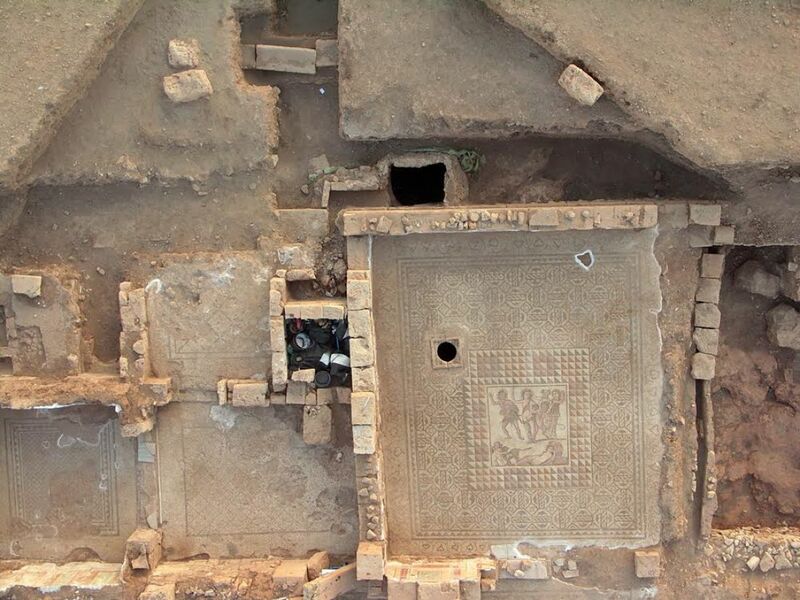 Most beautiful mosaic in Ptolemaic house shows a sleeping Ariadne with her future husband, the god Dionysus; coins from lamps workshop also found. 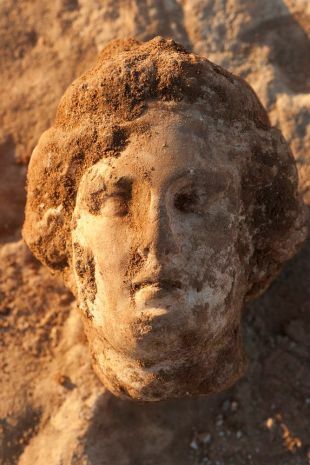 Archaeologists have unearthed statues, elaborate mosaics and other treasures in a 1,700-year-old villa in Ptolemais, a key trading port for the ancient Romans on the Libyan coast. 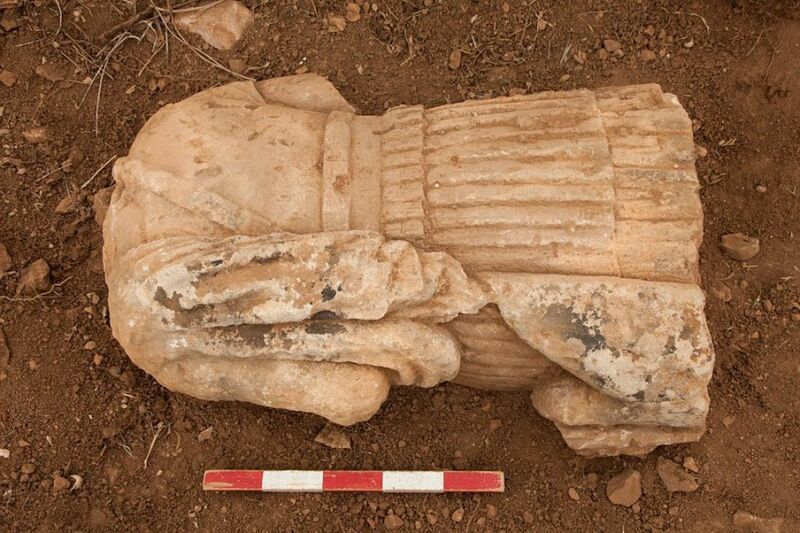 The artifacts and a hoard of 553 sestercii silver and bronze coins hailing back to Republican times were found in a vast building about 600 square meters in area, dating to the 3rd century C.E. 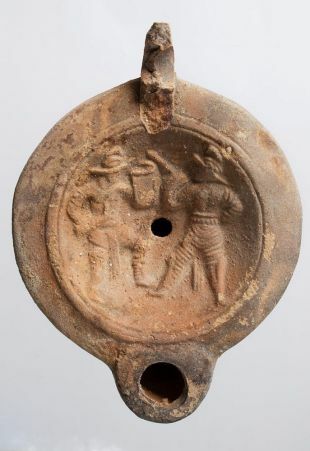 Most of the coins were found inside a room inside the house where terracotta lamps were manufactured. 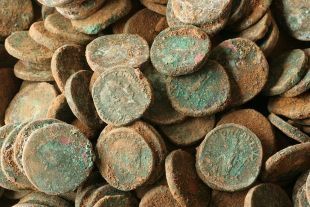 The coins may have been the earnings of local craftsmen, said archaeologist Jerzy Zelazowski of Warsaw University. 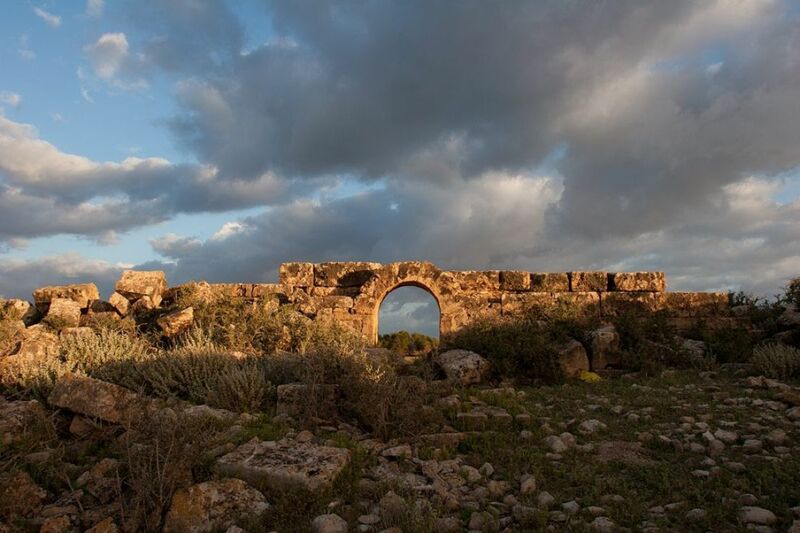 The ancient city was established almost 2,300 years ago, at the turn of the 4th century B.C.E., by ancient Greeks. 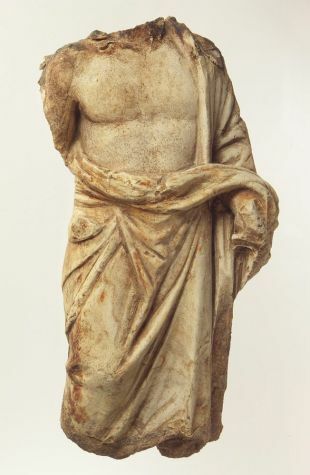 Its original name is not known, but it gained the name "Ptolemais" during the reign of the Ptolemaic empire over Egypt. The Ptolemaic Kingdom had been founded in 305 B.C.E. by Ptolemy I Soter, whose Hellenistic dynasty ruled a vast area stretching from Syria to Nubia, with its capital in Alexandria. The Ptolemaic rulers declared themselves successors to the Egyptian Pharaohs: the famed Cleopatra was a daughter of the late Ptolemaic ruler Ptolemy XII Neos Dionysos. As the power of the Romans rose, however, that of the Ptolemys waned, and they began losing territory to Macedonia and the Seleucids. Hoping to preserve what they had, the Ptolemies became vassals of the Romans. Cleopatra's father would pay the Romans through the nose in order to secure his dynasty, but after his death, Cleopatra ultimately failed to hold onto power. In 96 B.C.E. 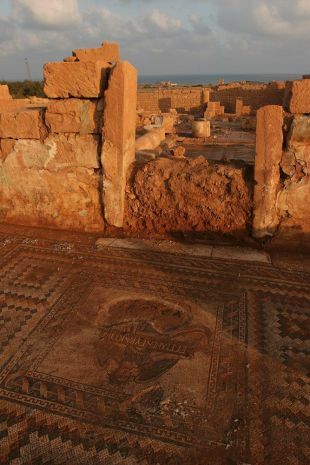 the entire province of Cyrenaica, including Ptolemais, was handed over to the Romans peacefully (400 years before the house in question was built). Rome however showed little interest in their new province, which deteriorated into a pirate’s nest. Not until the Wars of Mithradates (between the Roman Empire and the tiny Kingdon of Pontus south of the Black Sea, ruled by King Mithradates IV) in the 1st century C.E., did the Romans make an effort to restore order to Cyrenaica, to Romanize the locals and while about it, to resolve conflicts brewing between the Greeks and Jews living in the province. The villa with the recovered mosaics was built hundreds of years later around a courtyard in classic Roman peristyle arrangement. Among the loveliest of its mosaics is one depicting a sleeping Dionysus and Ariadne – a daughter of King Minos, who according to legend, would become the god's wife. Another mosaic depicts the Achillean cycle (the collection of epic poems about Achilles' adventures) representing Achilles on the island of Skyros – where his mother, fearful that he would meet his death at Troy, dressed him as a girl to avoid military recruiters. Two other mosaics in the villa, one in the courtyard and one in the dining room, bear the name "Leukaktios". The name was superimposed on the stonework at a later date, possibly due to ownership change during its centuries of occupation. The villa walls bore colorful frescos, imitating marble revetments with geometric designs. Several walls are covered with figural paintings, mainly depicting various species of birds. The end of this elegant house, after centuries of occupation, was probably due to the endless earthquakes plaguing the region. 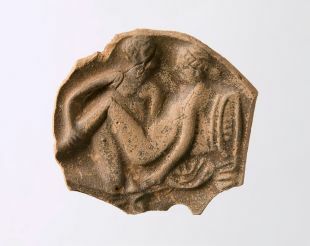 Two in particular, striking in the mid 3rd-century C.E. and in 365 C.E, may have doomed the house: the treasure of silver and bronze coins were found within the destruction layers inside the house. The city of Ptolemais, however, survived. At least for a while. 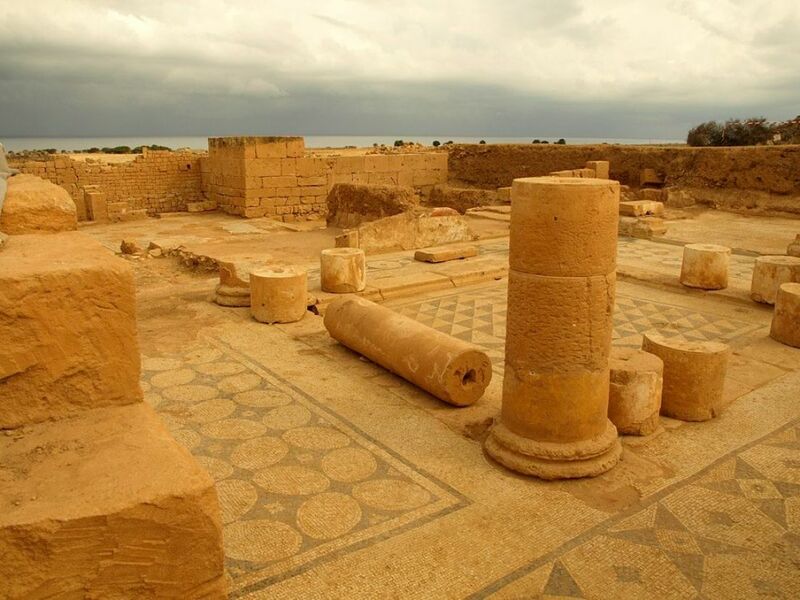 It would remain the capital of Cyrenaica until the year 428, when it was destroyed by the Vandals, who invaded North Africa too from their Germanic home base. 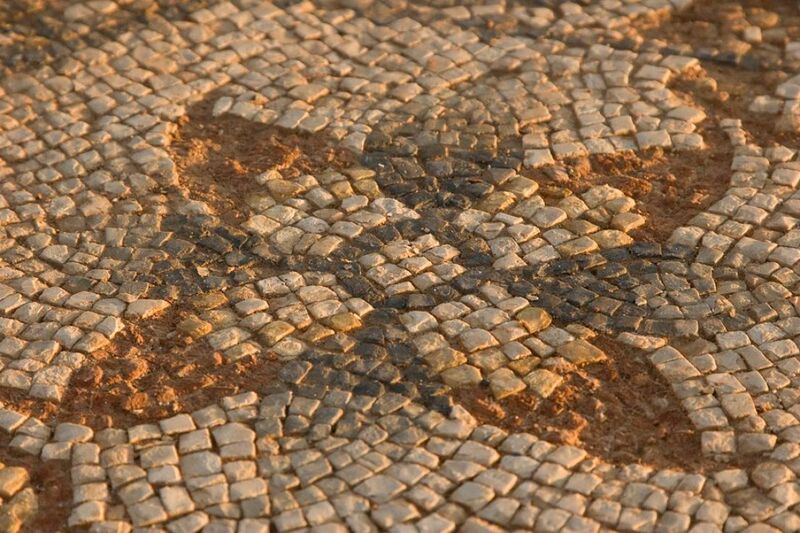 Ptolemais would be rebuilt under Justinian I, the byzantine emperor from 527 to 565. But after the Arab forces razed it again in the 7th century, that would be its end.